I-Square is located at 400 Bakers Park in Irondequoit, NY 14617. It is a mixed use development with phased construction for a total of eight new buildings. The first building which opened in 2014 includes The Market at I-Square which consists of six food and beverage options with shared indoor seating as well as sidewalk and rooftop seating and take out. The Irondequoit Conference Center is located on the 2nd floor which is available for business and private functions up to 120 people and includes a catering kitchen for classes and demonstrations. The second building in the development is the Imaginarium. The Imaginarium is a net-zero energy building used to creatively showcase and promote earth-friendly practices. The development also includes a stage used for summer concerts and other events. I-Square is the single most innovative private development that incorporates sustainable Green features such as Green Roofs, Rain Gardens, Electric Vehicle Charging Stations and a Storm Water Collection System. 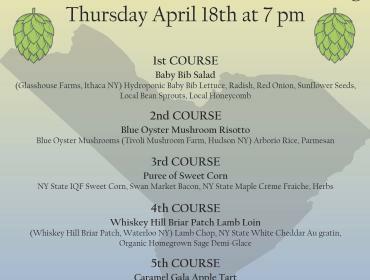 Homegrown is a tasting event that will feature New York State food, beer, wine and cider! 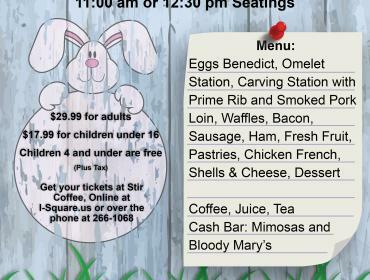 Join us for Easter Brunch in the Irondequoit Conference Center!